Long before our paths crossed in 2006, we each were unconventional women following our passion in both our personal and professional lives. Mara founded her company New Moon Visions in 1994 and had been painting images honoring the Divine Feminine for over two decades. Trinity, a counselor and energy therapist, had co-founded with her husband Louis, the Radiant Life Center in Eugene, Oregon in 1996. Thus began our extraordinary partnership and a four year adventure of co-creating Rainbow Warrior Awaken! Your Journey of Guidance and Healing. Well into our creative journey, when much of the writing was seemingly complete, another bolt of inspiration came to Mara. After spending a week with the 13 Indigenous Grandmothers, Mara knew the voice for RWA! was to be that of a grandmother sharing wisdom with her grandchild. A rewrite of every card was needed to incorporate this voice. We happily followed this guidance. The original inspiration for our deck arises from prophecies of the Rainbow Warrior that weave through many native cultures. These prophecies tell of a time when our planet is ravaged by environmental destruction and in a grave state of imbalance caused by ignorance and greed. A new tribe of people, of every color, culture and creed will gather and these Rainbow Children, through their brave, wise and compassionate actions, will help to heal the wounds of their Mother Earth. RWA! is our dreaming of a reverent and authentic way of living on our planet that springs from cooperation and love. Our “dream” is of a life guided by Spirit, in which our actions are in service to each other and to the health of our earth. Our vision of healing is one that begins within the individual heart and ripples outward into the global community. Rainbow Warrior Awaken! has become our taproot-the still center in the eye of the storm as we travel through these wildly discordant times similar to those described in the prophecies. 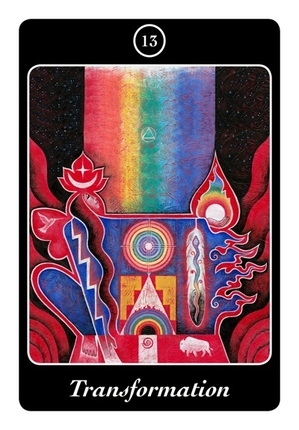 It has become a guiding force for our own lives as we strive to live as Rainbow Warriors. It is our prayer that RWA! serves as inspiration and assists our sisters and brothers around the world to discover and know in their heart of hearts that they indeed are the Rainbow Warriors we have been waiting for. First self-published as a 44 card set and 96 page guidebook in November of 2010, we are thrilled that RWA! is already in it’s third edition. We hope you enjoy our deck!